For more than 100 years, ice-patterned glass has been used to produce nonuniform decorative glass surfaces with typical structures, known as ice-flower effect. 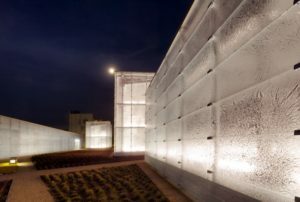 The creative uniqueness of such textured glass makes buildings architecturally attractive, while preserving their surroundings from mirroring effects. However, it is impossible to sufficiently regulate the form and size of specific patterns by using the current manufacturing process. This leads to a high rejection rate of glass products, which in turn creates production and scheduling problems. Innovation: V-Research, EARTO member through ACR, has developed a first-time industrial scale production using technically conditioned bone glue and optimised parameters for a high reproducibility of ice pattern. Such technological development has enabled the adaptation of textured glass to today’s market requirements and has systematized the application of this glass for various construction designs. Impact Delivered: This innovative process decreased the manufacturing costs (up to 40%), as well as the rejection rate and the energy consumption. A wide variety of ice-patterned glass products are already commercialised, including both outdoors applications like large-surface glass in facade construction and indoor applications such as anti-slippery glass floor or bath screens. ACR – Austrian Cooperative Research is an Austrian umbrella organisation for cooperative research institutes offering applied research and development especially for the benefit of SMEs.